Good morning friends! It’s Corey of Coriander Quilts here and today, I am excited to introduce you to Strawberry Jam. When I was growing up, every summer when June rolled around, it was strawberry picking time. My Mom would wake my sisters and I up at what felt like the crack of dawn – but more than likely it wasn’t much earlier than 7:00 am – to head to the strawberry patch. We’d spend all morning picking our berries and then head home to spend the rest of the day washing, de-stemming, and cutting berries to be turned into jam and/or frozen to be packed into my dad’s lunch box for the rest of the summer and winter. That’s the little story behind my collection, though I have another funny little story that also comes to mind whenever I think about strawberries. You met my Grandma Lulu when I introduced my Lulu Lane collection. You’ll remember the long winding lane leading back to her house with the weeping willow tree, swimming pool, and orchard. As it turns out, my grandma also had a strawberry patch. Growing up, my mom and her two sisters had to pick the berries as they ripened. My mom’s oldest sister, Diane, had a boyfriend in high school that wasn’t a favorite with the rest of the family. One day, he showed up at the berry patch during berry picking time wearing white pants….you might see where this is headed. My mom and her younger sister starting throwing strawberries at his pants! My mom’s recounting of this story often ended at this part usually amidst stunned stares from my sisters and I, full of disbelief that our rule-following mom would ever throw strawberries at anyone! No matter which memory I think of, strawberry season brings a smile to my face. And I hope this collection full of flowers, strawberries, ginghams, and dots will bring a smile to your face as well. I love that Sunnyside Up mixes so beautifully with Strawberry Jam, so I’m excited to start mixing the two collections together. Doesn’t this combination look good? That’s the fabric… now I’m excited to be sharing my Strawberry Jam quilts! I really enjoy the quilts I designed for this new collection and I hope that all of you do as well. The first one is In Addition – it’s a Jelly Roll friendly pattern. This quilt took so many turns in the design process and I’m tickled with the end result. FYI, that block uses all seven of my past collections. I do love mixing and matching, and all this scrappy goodness. The next quilt is Sincerely Yours. I knew that I wanted a cute little strawberry block of some sort to use in a quilt pattern. And when I decided that I wanted to include a Honey Bun as well, this quilt was born. The piecing is pretty straightforward; stitch and flip corners mixes with log cabin type piecing. Because it uses the 1-½” pre-cut strips in a Honey Bun so a lot of the cutting is already done for you. Sincerely Yours is also available as a kit from Moda. The kits and boxes are always so pretty! 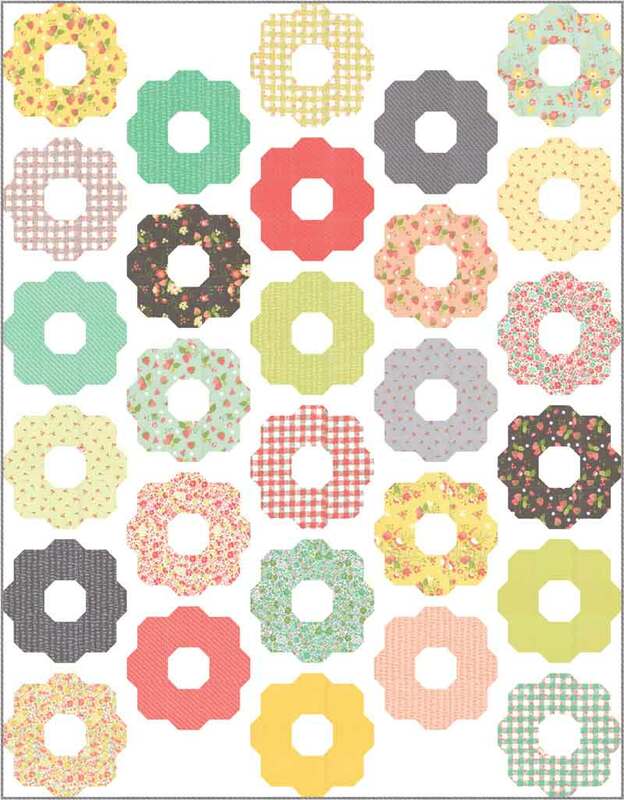 Another thing I am quite excited about is making “gingham fabric” using some of the prints from Strawberry Jam. I have showcased this in my Gingham Garden quilt. Again, this quilt is straight-forward piecing. 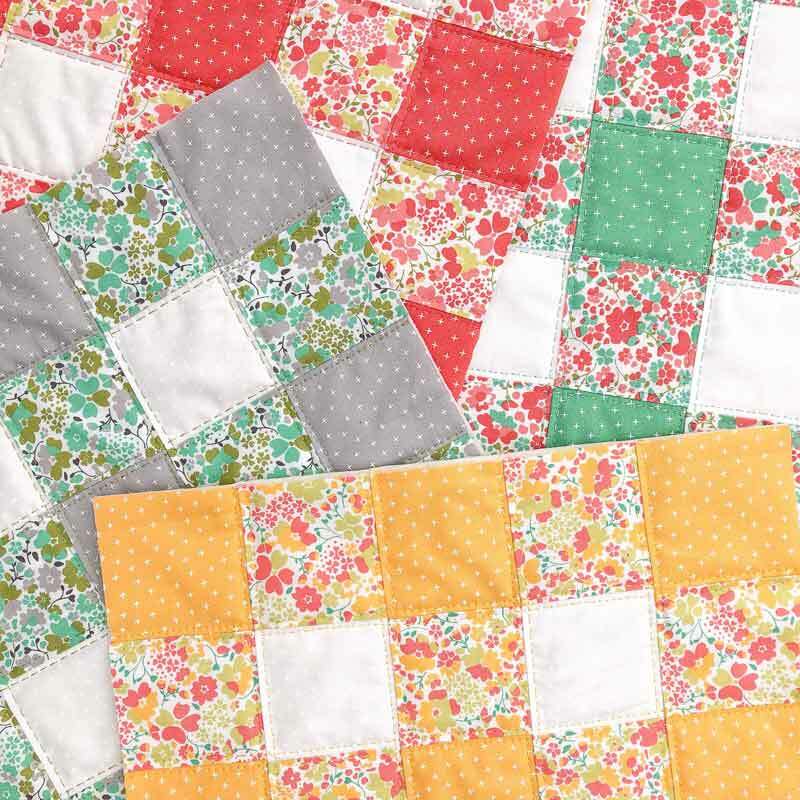 Even though the flowers look like little Grandmother’s Flower Garden blocks, they are traditionally pieced. This quilt is Layer Cake-friendly. Additionally, I couldn’t resist some cute gingham pillow covers. 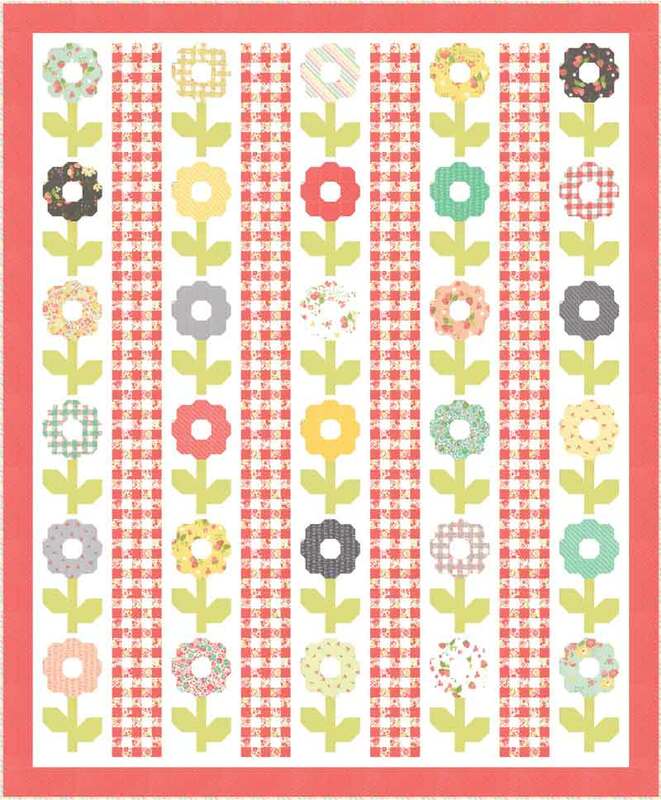 The prints you will want to use to make gingham are “Berry Meadow” and “Plus” in the various color-ways. There are various tutorials online on how to make pieced gingham quilts if you wanted to make a whole gingham quilt. As I was working on the Gingham Garden quilt, I quickly realized what a great block I had designed for the flower top. I had to stop in the middle of piecing to see what happened if I used just the flower top for a quilt. This quilt was a last minute addition to my Strawberry Jam line-up of patterns. Once I saw what this block could do I had to add this quilt into the mix. Meet Beholden. I might be the most excited about this quilt. 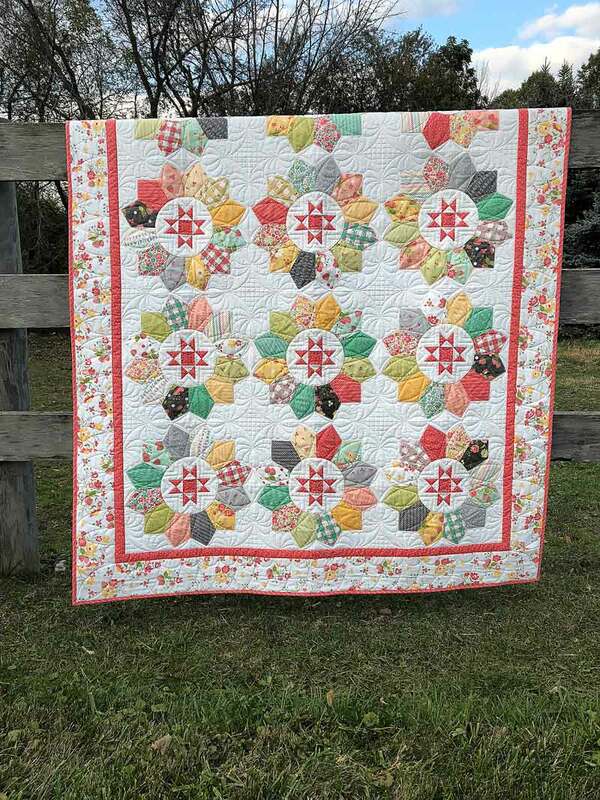 It is a 100% traditionally pieced quilt, with no templates, no half hexagons, & no hand piecing. 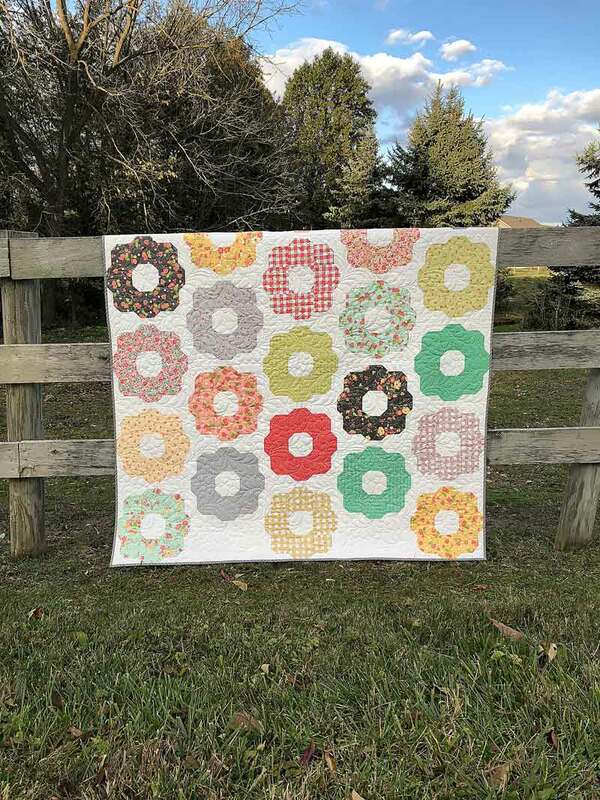 The end result is a quilt that looks like a Grandmother’s Flower Garden quilt. Beholden is a Fat Eighth-friendly pattern. I am so thrilled with this pattern! Up next is Plain & Fancy. Do you have these sorts of stores around where you live? Around here, in Amish Country, we do. They are stores that have items for the “Plain” people (Amish) and the “Fancy” people (English) and they are actually named Plain & Fancy. So, this is my Plain & Fancy quilt. 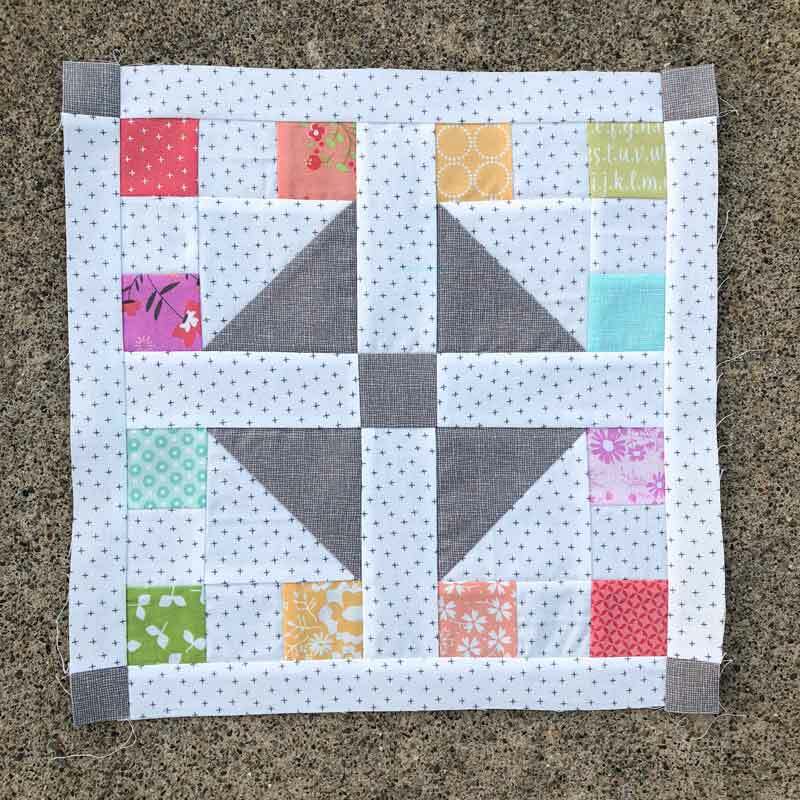 It has some plain Ohio Star blocks and some fancy Dresden Plate blocks all mixed into one, fun quilt. The Ohio Stars are pieced and then used as the centers of the Dresden Plates. This is a Layer Cake friendly pattern. 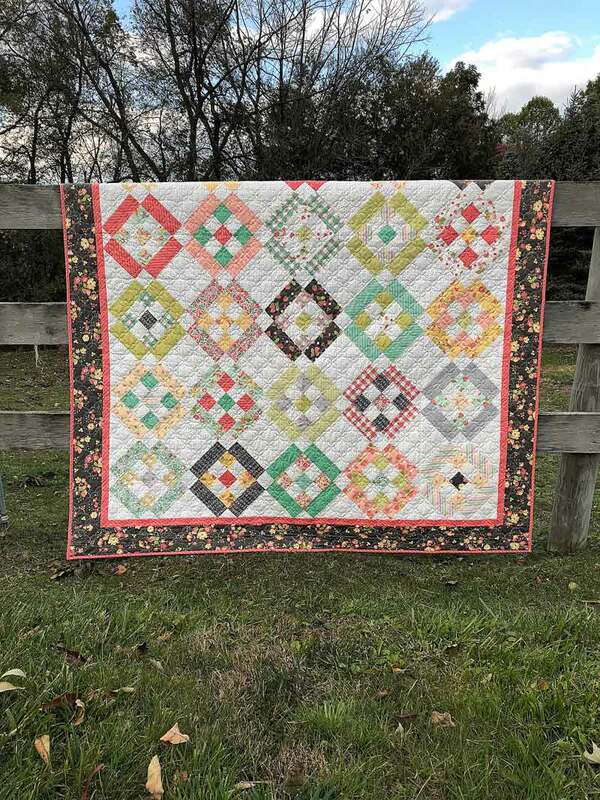 It has been beautifully quilted by Rebecca Silbaugh. I suppose that part of the quilt is pretty fancy as well. I’ve been using this binding in the different colors for almost all of my binding. This is a bias stripe fabric, so you can cut the binding straight across and still end up with a great bias looking binding. And one final quilt, this is Barn Star 3. 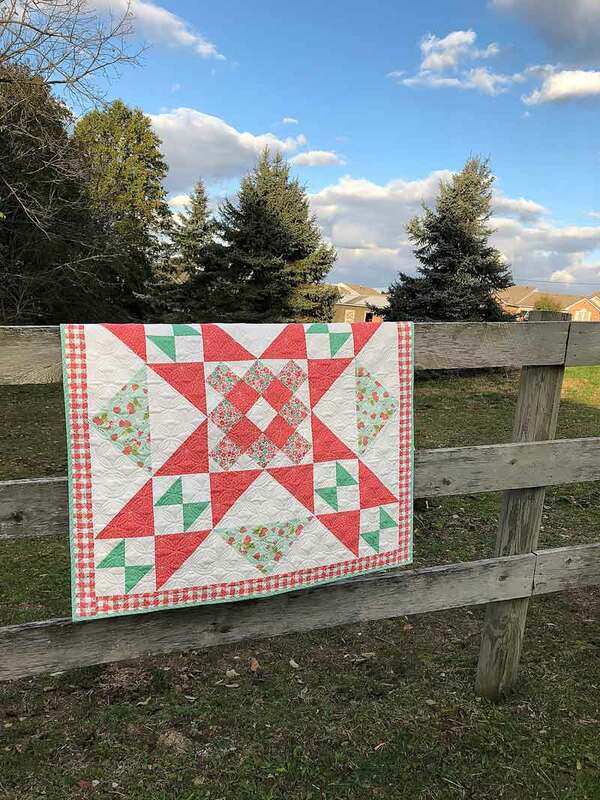 This is the 3rd Barn Star pattern in my Barn Star series – there are now four of them! It finishes at 40” square and uses yardage instead of pre-cuts. These patterns have been very popular! 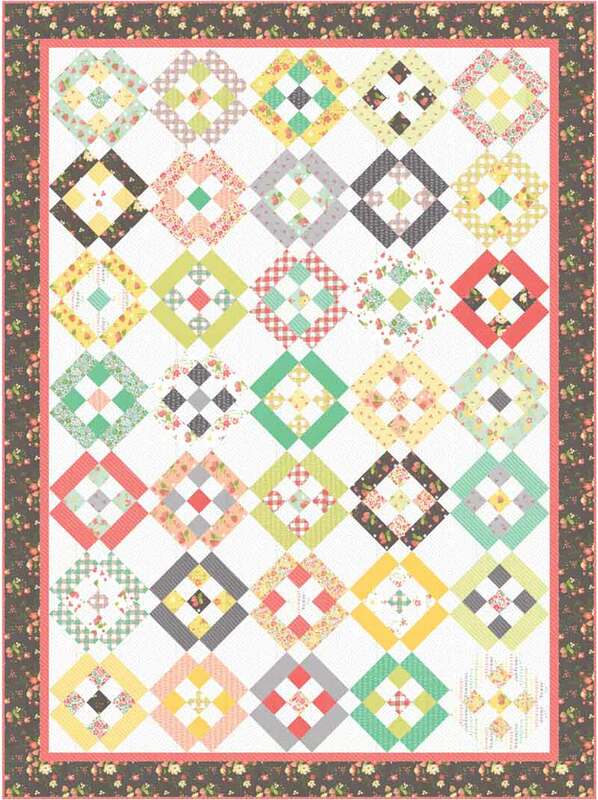 That wraps up the new patterns, I always thoroughly enjoy designing the quilts for each fabric line. 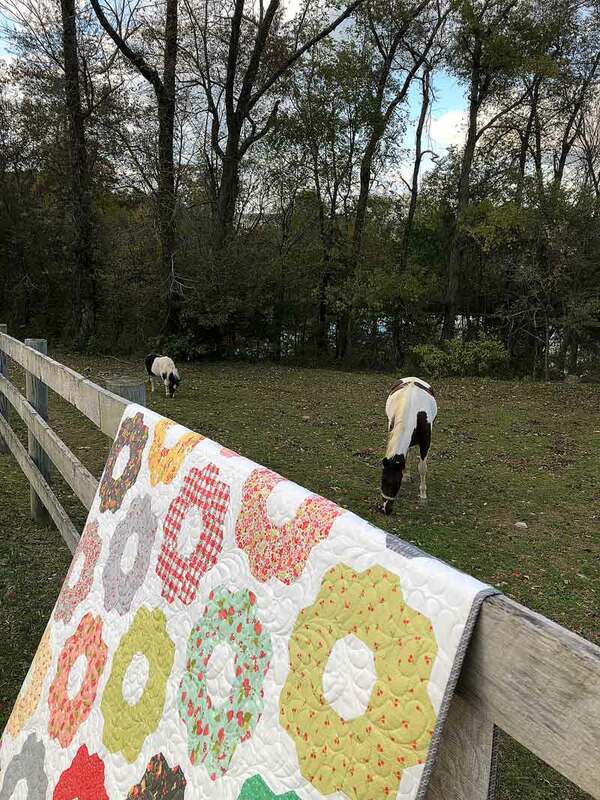 And, I think my daughter enjoyed coming along and hanging out with the horses while I took pictures of all of the quilts. One last thing to share. I’m often asked how I came up with Coriander Quilts. Corey and her quilts. What a beautiful fabric collection!!! Your pieces are so inspiring, too!! 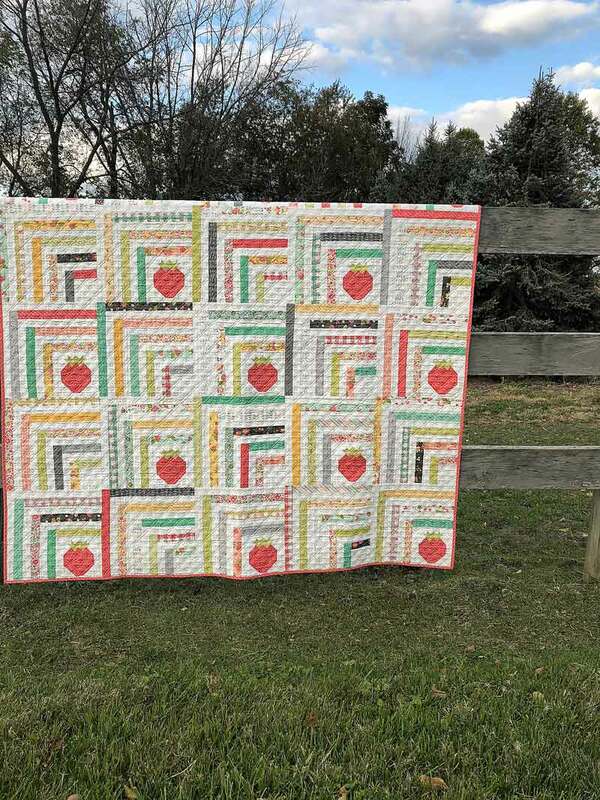 0 picking every summer riding on tractor family making strawberry cobblers and canning preserves, should say all the forks, the boys just ate the cobblers also beveryone of the quilts are beautiful and remind me of my childhood and family. Everything about this fabric represents summer! Beautiful, bright & brilliant. Can’t wait to get some. 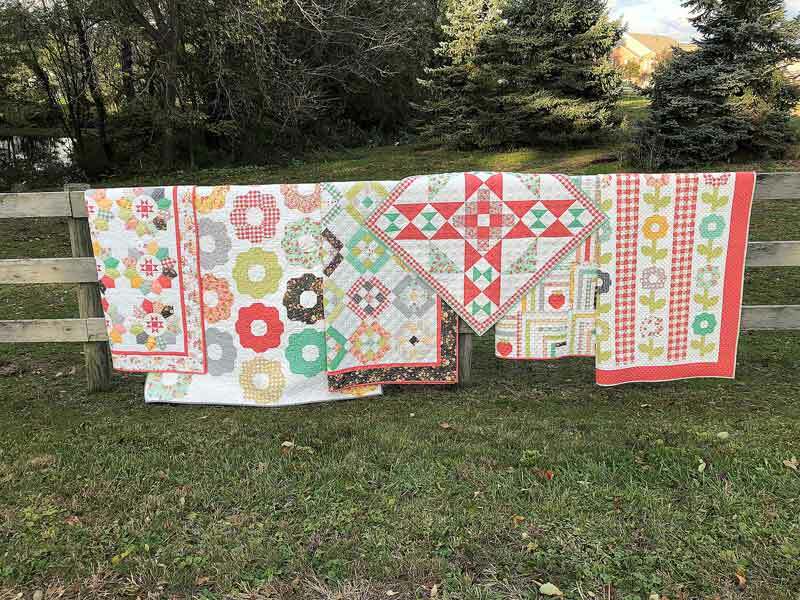 Beautiful quilts and fabrics, they go together so well. Love them. I’m swooning over these fabrics. I absolutely love the Barn Block 3, but my very favourite is Plain and Fancy. Congratulations on a great line. Beautiful. 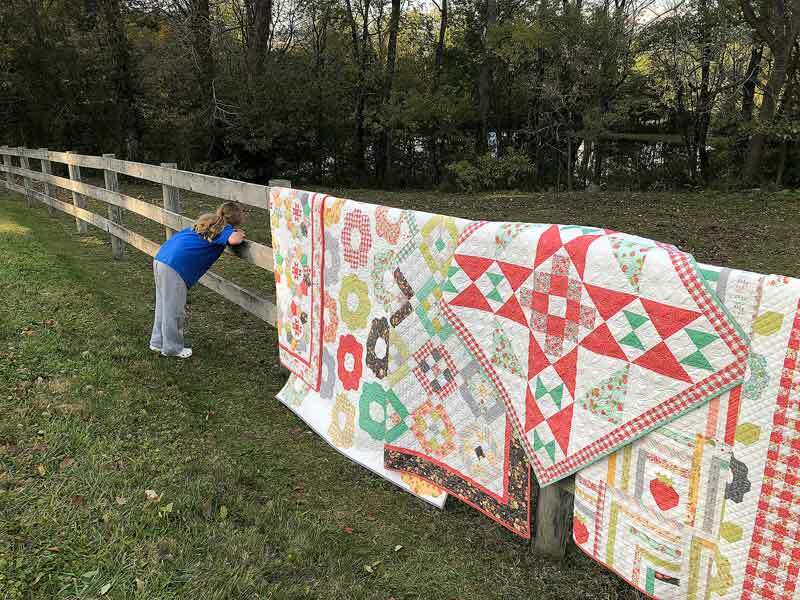 Beautiful quilts and fabric! I absolutely love Plain and Fancy as Dresden Plates have always been a favorite of mine. I also love the explanation of your business name ~ great idea! 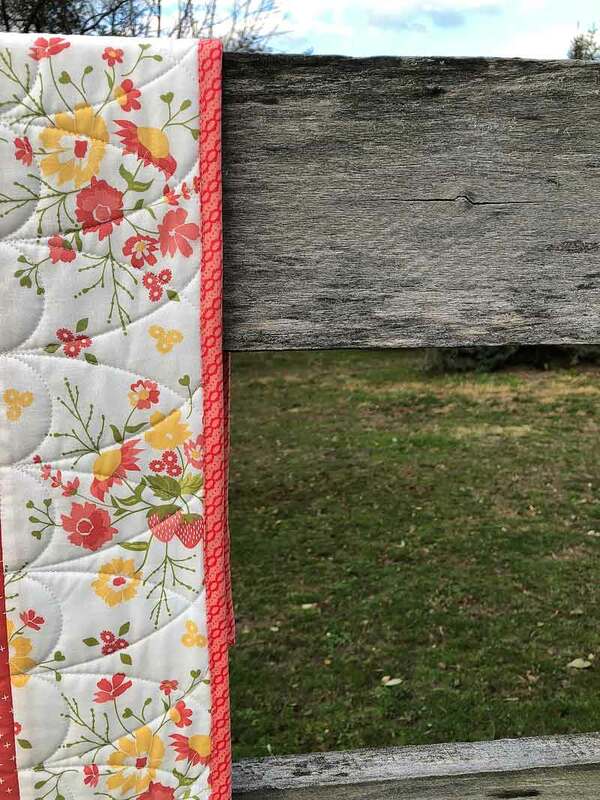 I love the quilting on the Plain and Fancy Quilt! It really makes your pattern shine! I have a sister-in-law named Debra Campbell! Fresh and fun I hope I can find these collections! 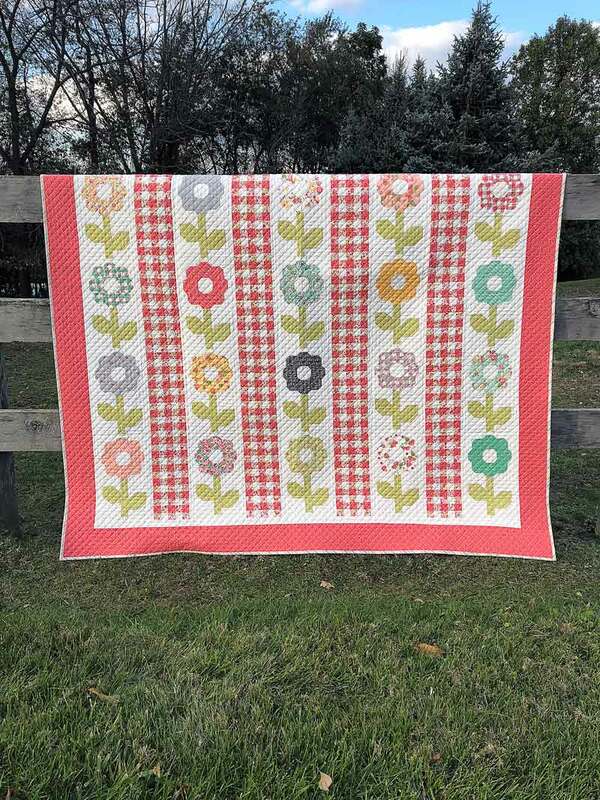 Your “Strawberries” are a delightful collection, and the quilts are a wonderful mix, plenty of ideas and options for everyone. And I love how you came up with “Coriander Quilts”. Corey, this collection is absolutely beautiful! Looking forward to starting a new project with them. Great fabrics and great quilts. 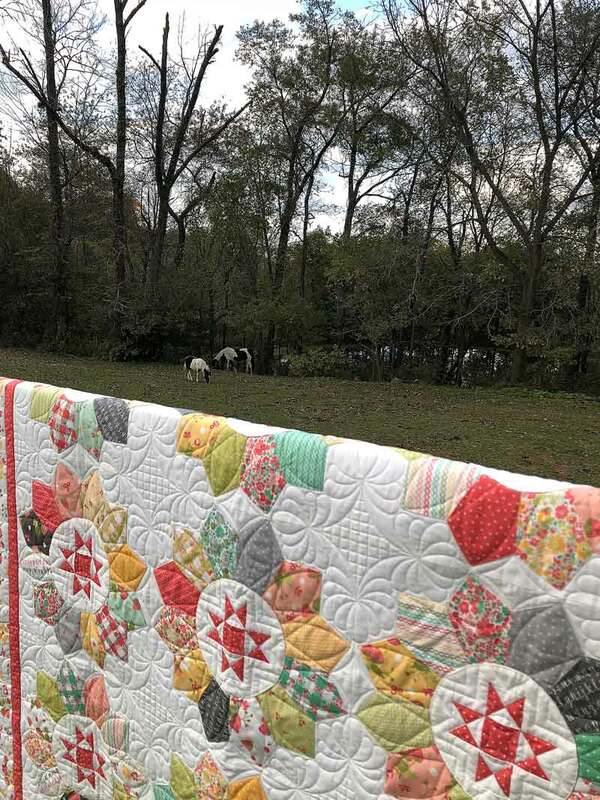 My favorite pattern is Plain and Fancy, and that quilting is gorgeous! As a (displaced) Michigan girl, we too picked all manner of berries! I never liked Strawberries until I grew them myself (vs store bought). Then I couldn’t get enough!!! I had a 40’x4′ raised bed just for Strawberries!! I love your strawberry picking story. What a wonderful fabric collection to capture this moment in your life. Thanks for the give away. Love your patterns! I have a daughter named Cory, but she doesn’t quilt, so she won’t be trying to steal your cute company name. I don’t do much appliqué, so my favorite pattern is “In Addition.” Your fabrics always look so fresh and happy. I’ve got a birthday this week so I may need to go buy myself a little collection. Thanks for such sweet designs. 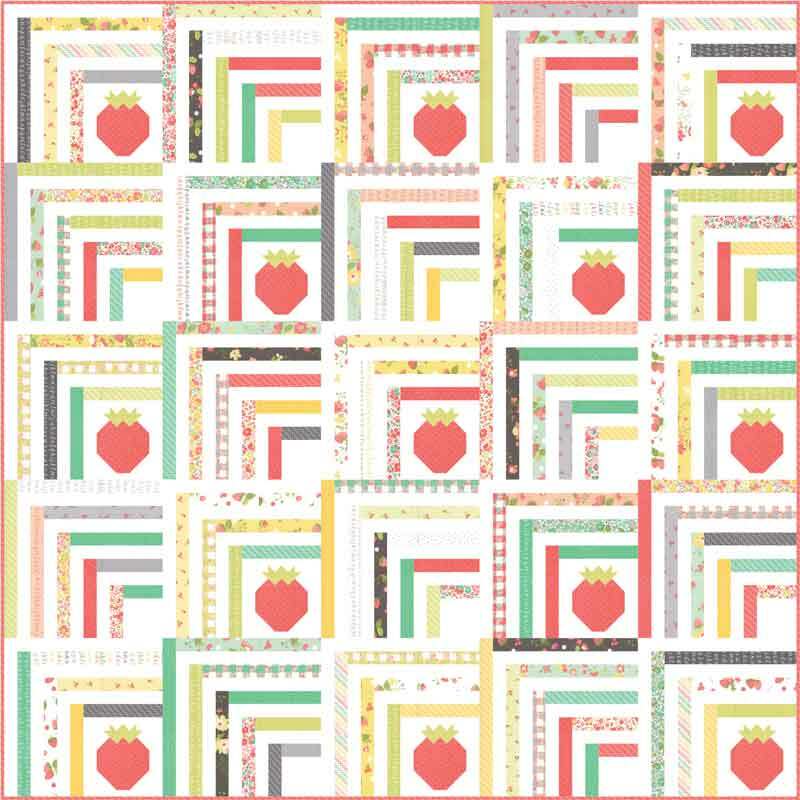 I adore the new Strawberry Jam Collection & thoroughly enjoyed reading your pattern making comments. I especially love that you have included the gorgeous blacks and greys in the mix as they add a perfect, but very different, mix to the collection. Most of all, the strawberry block is the best one I have ever seen. Congrats on a great new set of patterns and fabric! i LOVE this line, which is hard because I love all your happy fabric, but the colors just speak to me – good job Corey! Now to figure out how I can justify more fabric … hmmmm. I wish all of these were in my stash! Just beautiful! So enjoyed this tour of your lovely new fabric line – and delicious pattern designs. Especially love that they are all traditional pieced. Always wanted to make a Hexagon quilt without the paper piecing and templates. 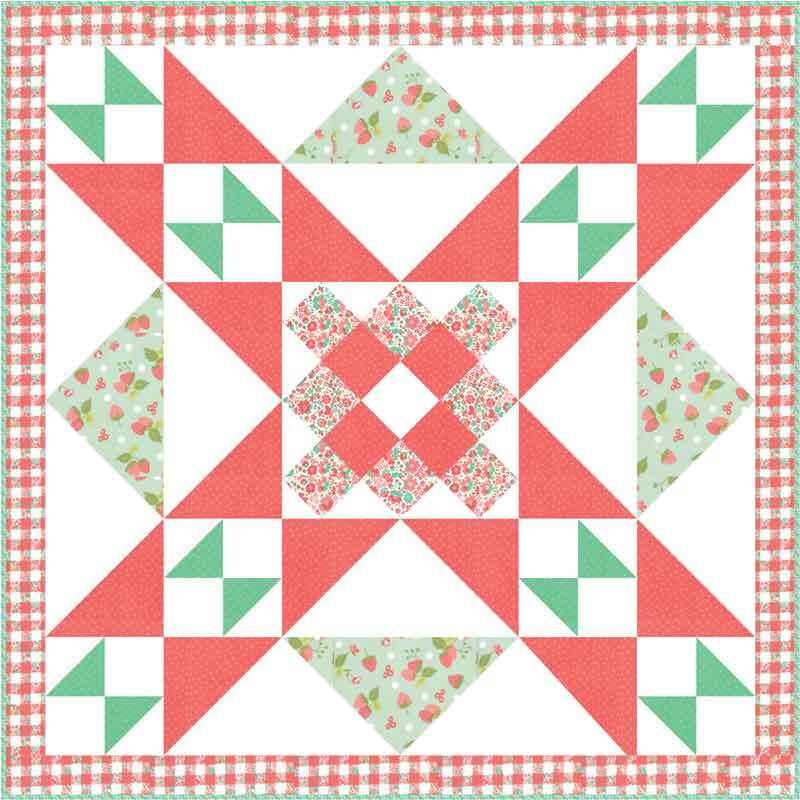 The cute little strawberry block has my heart in Sincerely Yours pattern. I need to add these to my list of ‘must makes’ :)! These fabrics are gorgeous! I love all things strawberry. In fact, just put 12 jars of homemade strawberry jam in the freezer for Christmas gifts! Great job!! You’ve done it again, Corey; I love your fabric collections and patterns. Strawberry Jam is awesome, and I’m so drawn to Beholden and Flower Garden. Your colors are always so pretty! Absolutely stunningly beautiful and gorgeous material and patterns! I want to order! Absolutely scrumptious! I love the cheerful look and colors….thanks for sharing your terrific creativity! Love your fabric, quilts, photos and stories! They are things I can relate to growing up and on our farm! Thank you for sharing.